The ultimate gift is a romantic, relaxing stay at our historic and intimate Napa Valley Inn, perfectly situated in the enchanting town of Calistoga. Gift certificates are available in any amount. Contact us to purchase, or call 707-942-4200. Surprise your sweetheart with one of these special treats to enjoy during your stay. Or take a little piece of Brannan Cottage Inn home with you from our retail shop. Gift wrapping is available for most items. 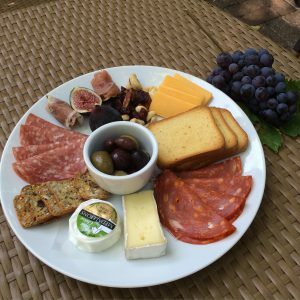 Assorted artisan cheeses, charcuterie, olives, nuts, savory crackers & toasts and fruit for a delicious treat for two. Please let us know about any dietary restrictions when ordering; gluten free crackers available. Cheese fanatics, rejoice! Let us create the perfect gourmet treat with assorted cheeses, nuts, dried fruit, artisan breads & crackers. Please let us know any dietary restrictions or preferences. 24 hr. notice required. Healthy & fresh appetizer to enjoy on our sunny patio or your private deck (Deluxe King rooms) – assorted fresh veggies (baby carrots, zucchini, cherry tomatoes, jicama, mushrooms, celery) with hummous dip, pita bread or whole wheat crackers. Sinfully cozy, soft and comfortable 100% cotton with beautifully stitched full color logo. 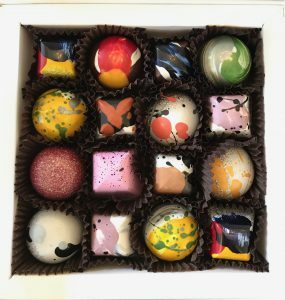 Boasting inventive flavor combos and exquisite ingredients, these little works of art taste even better than they look. Made right here in Calistoga. The perfect romantic surprise for your sweetheart! 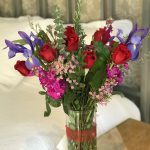 If your love has a favorite color or type of flower, please let us know, or leave it to us to choose the prettiest seasonal blooms. Gift card included. Perfect for proposals. Turn up the romance factor with red silk rose petals on your bed, flame-free pillar candles, 5 piece box of Earth & Sky Chocolates. Add chocolate-dipped strawberries for an additional $15. Please contact one of our hospitality goddesses for help with any gift item or room service order. 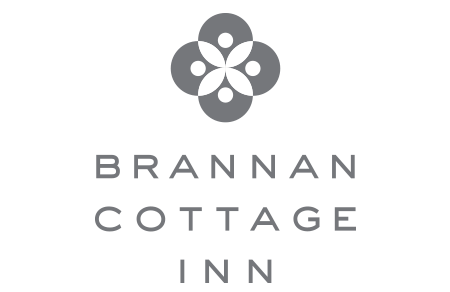 Brannan Cottage Inn proudly partners with select Napa Valley wineries to offer their wine club members special preferred lodging rates or complimentary VIP amenities when you mention they sent you. Ask about it at your favorite winery. You must mention the winery and where you saw their special offer when you call us at 707-942-4200 to book. Restrictions and black out dates apply; subject to availability. May not be combined with any other special or offer; not valid for group reservations. May not be applied to existing reservations. Rate is only available when you book direct with us. Our insider concierge staff is happy to suggest or help arrange exceptional wine tasting experiences during your stay… just ask. Email us or call 707-942-4200. We look forward to your visit! Happy winetasting. Billed as the ultimate celebration of film, food & wine, the 5th Annual Napa Valley Film Festival lights up this gorgeous region from Nov. 11 – 15. For the moviegoing fanatic, it’s a chance to dive into a pure environment of creativity, stimulation, inspiration and rare access. Bonus: the fabulously offbeat Indian Springs Gliderport Cinema, a fan favorite screening venue, is a 5 minute walk from the Inn. The Festival kicks into gear with the world premiere of Somm: Into the Bottle directed by Jason Wise on Wednesday. Highlights include Thursday’s Festival Gala, Celebrity Tributes to John Travolta, Bruce Dern, Keegan-Michael Key and rising stars of tomorrow Friday, with over 125 films screening in 4 Festival Villages over 5 days. Wine tasting pavilions, film industry panels, culinary demonstrations and fabulous winemaker dinners are all part of the fun. See the 2014 Festival Sizzle Reel for a taste. Book your Festival stay at Brannan Cottage Inn here. Questions? Call us! 707-942-4200. Buy your NVFF Pass and save 10% on Pass Plus or Festival Pass with promo code BCI. Many other options are available including individual special event tickets, Midweek and Day Passes and rush tickets. Experience award-winning luxury in a uniquely historic, welcoming setting as you save 15% on Best Available Rate midweek, 10% on weekends, with this limited time offer. We’re celebrating our Best Hotel Renovation Award from Sunset Magazine’s 2015 Travel Awards. This 1860 Victorian inn, listed on the National Register of Historic Places, has been stylishly reinvented with modern comforts. Non-cancellable, non-refundable reservation; credit card is charged in full at time of booking. Cannot be combined with any other special or discount. Not available for existing reservations; black out dates (9/4 – 9/7/15) apply. We’re also proud that our warm, knowledgeable Napa Valley hospitality won a TripAdvisor 2015 Certificate of Excellence for 4.5 – 5 star reviews from delighted guests. Book Now or call 707-942-4200 for more information. We look forward to welcoming you! Soak It Up. Summer’s Best in Napa Valley! Slip into summer at Brannan Cottage Inn where lazy days of local Napa wine tasting, strolling through historic Calistoga, and completely surrendering to relaxation come naturally. Snap up this great summer rate for a mid-week or two-night weekend escape complete with wine tastings and historic yet modern accommodations. In June, extend PRIDE celebrations with a couple days of wine country R&R with a sweet welcome treat plus insider tips from the Inn’s savvy staff. Brannan Cottage Inn’s “Simply Summer” is available June 1 through August 31, 2015, starting at $279/night midweek and $309/night on weekends; tax and gratuity not included. Two-night minimum required over weekends; subject to availability. Blackout dates apply; May not be combined with any other offer or used toward existing reservations. To book your “Simply Summer” stay, click here and mention PRIDE month, or call us at 707-942-4200. We look forward to welcoming you! Shake off the winter blues by booking a “Brannan Spring Break” in Napa Valley. As days grow longer, grapevines begin to bud, and the Napa Valley rejuvenates with the arrival of spring. 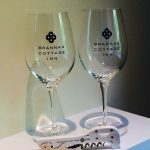 Brannan Cottage Inn offers an ideal location to call home in Calistoga for some wine country R&R. Save 10% on your midweek stay (Sunday – Thursday), savor wine-themed welcome amenities, and take home a pair of classic BCI coffee mugs as a souvenir of your visit. Chat up the Inn’s well-connected hospitality staff who will happily provide off-the-beaten-path adventures just outside the Inn’s door. Or tap their exclusive app to create a customized itinerary. Brannan Cottage Inn’s “Brannan Spring Break” rate is available March 7 through May 31, 2015, starting at $242/night midweek and $299/night on weekends; tax and gratuity not included. Two-night minimum required over weekends; subject to availability. May not be combined with any other offer or used toward existing reservations. Black out dates apply: not available 5/24/15. Spring is also wedding season and Brannan Cottage Inn offers a picture-perfect location for intimate elopements. click here for more information.